In connection with the Stack Overflow moderator elections, we will be holding a Q&A with the candidates. This will be an opportunity for members of the community to pose questions to the candidates on the topic of moderation. Participation is completely voluntary. During the nomination phase, (so, until Monday, February 17th at 20:00:00Z UTC, or 3:00 pm EST on the same day, give or take time to arrive for closure), this question will be open to collect potential questions from the users of the site. Post answers to this question containing any questions you would like to ask the candidates. Please only post one question per answer. An asker repeatedly flags their own question and says that they need to delete it or they'll be fired, because they mistakenly posted proprietary code. There are several good answers on that question. What do you do? How would you handle situations involving less than warm welcomes given to new users? For example, a new user posts a well written first question consisting of clearly defined requirements, admission of a high level of domain ignorance, and a request for the proper solution methodology, but no actual code attempts to tackle the problem. Said question receives many downvotes and impolite comments. The asker gets upset about the situation and complains to you directly on chat and/or meta. 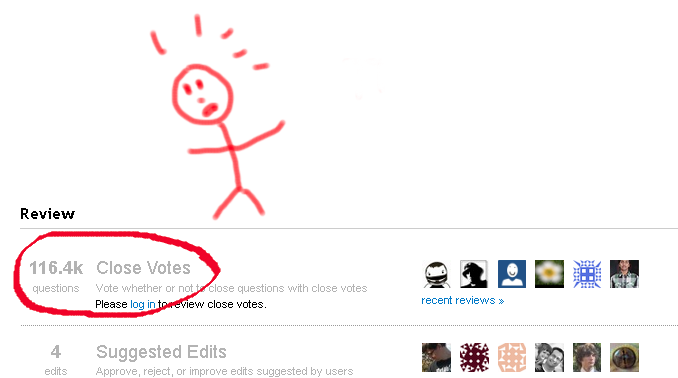 How many Close Vote reviews have you done? As a reviewer, how do you feel about size of The Queue reaching over 110k? The community considers this a problem, as indicated eg by over 100 upvotes cast at Close Votes review: I'm going on a strike! - what's your take on these concerns? What do you think of New queue for moderators: questions that appear stuck in close votes review at SO? Update: over 100 upvotes, not bad for a question accused of being "not relevant to a mod's duties". Thanks to all who share concerns expressed here! How would you deal with complaints about a user successfully suggesting a large number of low-quality edits? As a moderator, your votes become binding. Actions you used to take like flagging, closing, and deleting will take effect immediately without any input from any other users or moderators. If you became a moderator, would your actions be more like an Exception Handler or a Janitor? To put it in other terms, do you think your moderation style will be more focused on allowing the community to run the site and you will only step in to handle exceptions, or do you think your style will be more focused on aggressively trying to "clean up" the site? I realize a moderator's duties involve both roles, and that there is no right answer to this question. Identifying with either role is valid, and will appeal to different people. What are your views on the chat feature? Do you plan to spend time in the chat once you're elected and assist in its moderation? A diamond will be attached to everything you say and have said in the past, including questions, answers and comments. Everything you will do (and have done) will be seen under a different light. How do you intend to handle that responsibility? (Branched off from Grace Note's backup default questions list). All of you feel that being a moderator will make you much more effective than simply being a high-rep user. What moderator ability, if any, do you think can be given to high-rep users instead to make the community in general more effective? If this ability was given to high-rep users, would you still want to become a moderator? In what situations should a moderator delete a question themselves? How would you handle a single user that is upset at a moderator action you have taken? For example, if someone posted on meta "This mod deleted my [question|answer|comment] and he is abusing his power," how would you react? You see the question which was put on hold by another moderator (not with 5 votes of community). But you think that this question is good and should not be closed. What will you do? There are lots of people on StackOverflow, and their opinions on "how the site should work" also differ a lot. Some people are mainly driven by a desire to help and/or participate; as a result, their activity might not be regarded as efficient or even desirable when viewed under a certain light. For example, they might choose to answer a question even though it has been obviously (to a regular) asked and answered before. For these people, directly helping another member has immensely more value than clicking buttons (which they might still do, the two actions are certainly not mutually exclusive). On the other end of the scale, some people are driven by StackOverflow's "one quality answer site to rule them all" aspirations; as a result, their activity might stick to the letter of the law and make it harder for others to get the answer they came here for. For example, they might downvote/delvote questions and answers because the answer already exists and therefore another one might be detrimental to a future seeker's ability to discover the canonical version. For these people, maintaining the site's knowledge base has immensely more value than handholding a newbie (which again, they might do). How do you intend to moderate both these types of do-gooders so that everyone goes home satisfied at the end of the day rather than deciding that SO is full of undesirables? Do you have a strong opinion of your own on the matter? How will it affect your stance as a moderator? You see a Meta post calling out a user for spamming the site with edits containing referral links. After checking the details, you notice that this is not your typical spammer. Instead, the user has more than 2000 reputation (and thus also able to edit posts directly). Because of the rather nasty kind of spamming - adding his spam to posts from reputable users - people call for the user to be deleted immediately. How will you deal with this situation? What is, in your opinion as a potential future moderator, the biggest problem that Stack Overflow currently faces? If you were to get elected, what actions would you take towards resolving these issues? While the moderator position you're nominating yourself for is a voluntary position, there is a minimum amount of time that you would need to be available in order to be an effective moderator. How much time would you be able to spend on mod duties at Stack Overflow, and are there any known circumstances in which this will change in the future? During any given time, only about 25% of the mods on Stack Overflow are actively moderating (we currently have sixteen mods, which means our active base is four). The period of maximum productivity for new mods seems to be the first year. After that, a certain degree of burnout sets in (let's be honest). It takes about an hour to handle 100 flags, once you gain some experience. The top performers handle 200 to 300 flags per day. Currently, we need to be processing about 200 more flags per day, and there are three open moderator slots. Would you be able to make such a commitment? If a post has thousands of views and at least +50 upvotes, why would it be a good or bad idea to put it under a historical lock instead of deleting it? The answers are obsolete, or so many that two-thirds are variations/duplicates on the first set of answers posted. You've had a bad day at work/home/school. How do you make sure you don't unfairly take it out on poor innocent posts/users? Describe your perfect day. (This is a trick question, the only correct answer is to "Flag as off topic"). In all seriousness, questions that have been edited more than 10 times by the asking party are converted to community wikis. Do you think it is appropriate to rollback the community wiki status upon request? Further, what is your opinion of this policy in general (do you see as punishing the asker for improving the question)? You happened to close a question on Stack Overflow but the close reason wasn't very much acceptable. The OP brings up that issue on Meta where the community feels that it was wrongly closed. Another moderator walks by and opens the question, suggesting that your action was indeed questionable. "How/What" would you, as a Moderator, "react/respond/do" in such a situation? A desperate user has posted the same question (some borderline between programming and configuration) to many SE sites. The problem is badly defined, but there are SCREAMINGS that this is URGENT and he BEGS FOR HELP. The user is surely aware that posting his question everywhere to increase the chance of getting an answer is a bit of an egoistic behavior, but he thinks his problem is more important than the others. It will most likely happen to you. There is no way to avoid it, no matter how carefully you moderate. This aspect of moderation takes a certain amount of thick skin. Do you have it? What would you do if a conflict with a user "gets to you"? Frequently it is noticed that some users who are active in the review queues on Stack Overflow are merely clicking "No Action" or "Accept". As a moderator, what action is appropriate to take against these so-called "robo-reviewers", and would you be willing to investigate instances such as these and take that action? What would your stance be on educating new users on how to ask questions, and the consequences of asking too many poor-quality questions? The growth of the Close Votes queue and the frequency of What can I do when getting "We are no longer accepting questions/answers from this account"? type questions here on Meta seem to indicate that we're not in an ideal position on that front. Although we do have resources such as How to Ask (and many wonderful others), do you think we could do more to help newer users take advantage of them? Or do you think we are already doing enough as a community, and should hold new users accountable for not already taking full advantage of the resources at their disposal? Not the answer you're looking for? Browse other questions tagged discussion stack-overflow election . How can I encourage Stack Overflow to rein in the 'subjective' vigilantes?